Fellowships awarded to voice teachers in order to assist with their attendance at the upcoming NATS National Conference. 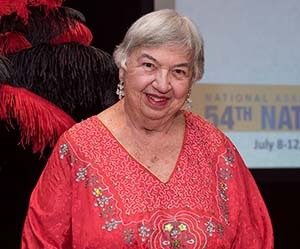 The National Association of Teachers of Singing and the NATS Foundation have announced that 14 recipients have been selected for the 2018 Joan Frey Boytim Award for Independent Teachers. These fellowships are awarded to voice teachers who are NATS members in order to assist with their attendance at the biennial NATS National Conference. Thanks to the generosity of Joan Frey Boytim (pictured), a $1,000 award will be granted to reimburse each recipient for eligible expenses associated with their attendance at the 55th National Conference in as Vegas. Independent teachers comprise a significant proportion of NATS membership. Our partnership with Joan Frey Boytim, author of The Private Voice Studio Handbook and editor of The First Book series of anthologies among many other works, offers a dedicated source of support for NATS independent teachers. Additional support is encouraged. Please consider a gift to the NATS Foundation to support this and other valuable programs. Click for information. Click here to learn more about the Joan Frey Boytim Awards for Independent Teachers. The 55th NATS National Conference will take place June 22-26, 2018, in Las Vegas. For more information on the Conference, click here.